Manhattanite Peter Helfer found his Audi covered in ice from a broken water main. His car was on newspaper covers, on morning news shows, and all over the internet. Here's how it happened, in his own words. — Ed. It was around 11:30 pm on a frigid Sunday night, shortly after the NY Jets potential Super Bowl run came to a disappointing end. I took a cab back to my apartment with my wife but before going up, we went to move my car to a new parking spot and couldn't believe what we were looking at: the exterior of my car was absolutely covered in 6-12 inches of dirty, frozen street water from a main break and the car was sitting in an almost frozen sink hole. The street was completely ripped open and water had been gushing up from underneath, and then adding insult to injury, the car was sprayed with water from passing cars for 48 hours....then the temperatures dropped even more and literally froze my car into 2nd street. When we got to the car, we managed to open the driver side door which didn't have much ice on it, climbed into the car and warmed it up for 45 minutes, but not a piece of ice was moving. And that's when I knew it was going to be a much longer and more painful Monday than expected. When I woke up on Monday, it was 4 degrees outside and there was no shot that the car was going to be my transportation to work that day. I didn't want to leave the car there as is — afraid it would be towed, possibly damaged by any of the emergency crews that were fixing the street, or sitting there with NYC parking tickets on it. As I stepped out of my apartment building, not only did I see a closed road with DEP workers checking out the main break, there were news trucks camped out waiting for the owner of the car to arrive. "Oh man, is that your car>? "What are you going to do about this?" "Do you have a bunch of salt you can put on it?" "How are you going to get it out?" "You better be suing the city"
You know what you need? Those large chlorine tablets that melt snow. Have a friend get you some from Home Depot." "Why did you leave your car in a puddle?" "Why did you break your window?" This day started at 9:00 am and did not end until 4:45 pm when I decided it was time to attempt to drive the car out of the ice and it would never have happened without a ton of help from the DEP workers who "needed to get the ice off the street to do their work." They also helped me steam some of the ice off the tires, lent me a pry bar to chop the ice away from the street, and then as I got tired, would make small stress fractures in the ice with a hammer so that the big sheets of the ice would fall to the ground. When it looked like it was time for me to drive away, all of the workers, tons of people on the street, and some media who had been hanging around all day cheered me on....and the car made it out! I pulled away from the chaos, chipped some more ice off the car so I could see while driving, and brought it straight up to the dealership to thaw out and be fixed. 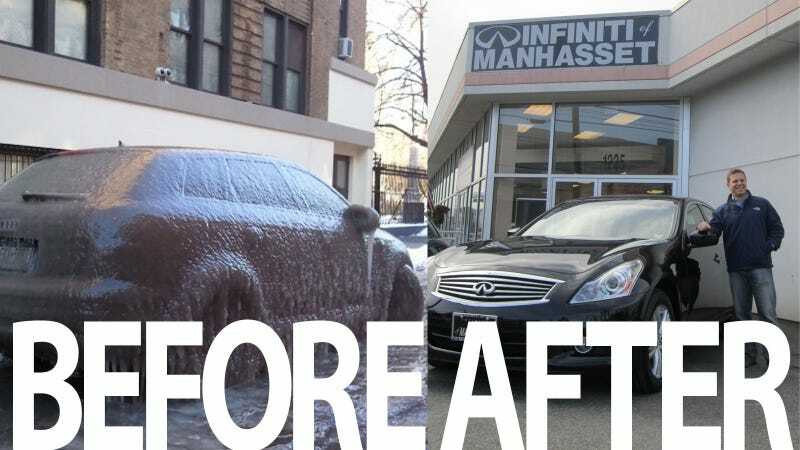 After 10 days and $7,500 of parts/labor, the car was ready to be picked up on Friday, Feb 11th, but the day before I picked up the car, I received a surprise call from Joe Valentino and David Fine of Infiniti of Manhasset. They saw all the coverage of the frozen car and decided that they would offer me a brand new car for all the trouble I had been through. I was upgraded to an all-wheel drive Infiniti G37x, which should never leave me stuck in ice again.